One school district’s loss is another school’s treasure, to paraphrase an old saying. School furniture, classroom supplies, older technology including desktop computers, smart boards, textbooks, and more will soon be leaving Lake Local Schools classrooms and will be shipped to schools near St. Michel and Port au Prince, and on the island of Malpasse, Haiti, to benefit a non-profit called TeacHaiti. “These desks will last 100 years. And now they will have a complete computer LAB where before there was not a single computer,” said Dean Windham, as he stood in one of the hallways in Lake High School next to stacks of desks, chairs, and much more school equipment that he purchased from Lake Local Schools’ recent online auction. He felt he had purchased all the items for a great price; funds for the auction purchases were provided under the direction of TeacHaiti founder Miquette Denie McMahon who also helped to scan through the available auction items for purchase with Windham. "Once they arrive in Haiti these smart boards we are shipping will make a positive impression on government leaders and teachers. It will elevate the TeacHaiti schools' position because they have this kind of equipment, and will help to attract and retain teachers. This equipment will be important in building relationships," added Windham. Windham, along with his daughter, Lake senior Abbey, 17, are the primary planners/organizers of this school furniture/technology transfer from Lake Township to the Caribbean country. Approximately 20 Lake National Honor Society students assisted Abbey last week and earlier this week, moving countless pieces of furniture, books, and related school equipment from Hartville and Lake Elementary to a ‘holding area” in the Lake High School hallway. “It’s a win-win for us,” said Abbey, referring to Lake Local disposing of unwanted school items and TeacHaiti being able to receive them. Plans called for all the items Windham purchased to be placed into a shipping container May 31, 2018 that will be located directly outside the high school. By June 1, 2108 the full container will be on its way, due to arrive in Haiti by August 1 if all goes as planned. Providing funds to pay the cost of shipping the container to Haiti, and costs to go through international customs, still remain, however. To raise this money, Abbey recently created a “Go Fund Me” account and invites donors to contribute whatever they can to fund the necessary shipping/customs costs, which the Windhams estimate to be approximately $17,000. To donate using Go Fund Me, go to www.gofundme.com, and enter “Lake-for-Haiti” in the search bar at the top of the web page. Another option is to send cash or checks care of Evermore Church (home church of the Windham family) noting “TeacHaiti” in the memo line. The church is located at 1470 Smith Kramer St., Hartville, Ohio, 44632. Dean and his brother Dave Windham first came to know and love the people of Haiti as a result of church mission work they undertook beginning in 2012. In 2015-2016, Abbey and her entire immediate family visited Haiti, where they and other volunteers worked on building houses, constructed household furnishings such as bunk beds, helped in orphanages, and on new local microfarms being established. “My mom, sister, and I met kids and spoke English with students that we sponsor, and visited the school in Port au Prince,” said Abbey. During that trip the family also met Mrs. McMahon, who founded TeacHaiti in 2007. 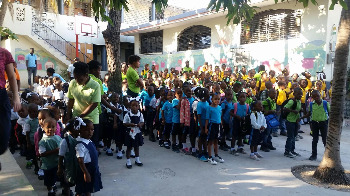 The organization seeks to empower the children of Haiti to emerge from poverty through education and improved health in the communities they serve. Donors are invited to help Haitian children by becoming a sponsor to pay for their classroom education. Since this meeting the Windhams have directed their focus to assist TeacHaiti and the children it serves. Lake Local recently conducted its online auction in order to make way for new furniture and technology arriving soon to go into the district’s elementary, middle/high, and primary schools that are currently under construction or being remodeled. Lake students and adult volunteers help load a 40-foot shipping container parked outside Lake High School May 31, 2018 bound for Haiti. Students, staff, and a school operated by TeacHaiti. Abbey Windham stands in front of full shipping container before it leaves the Lake High School parking lot.